I did a little experiment this morning. 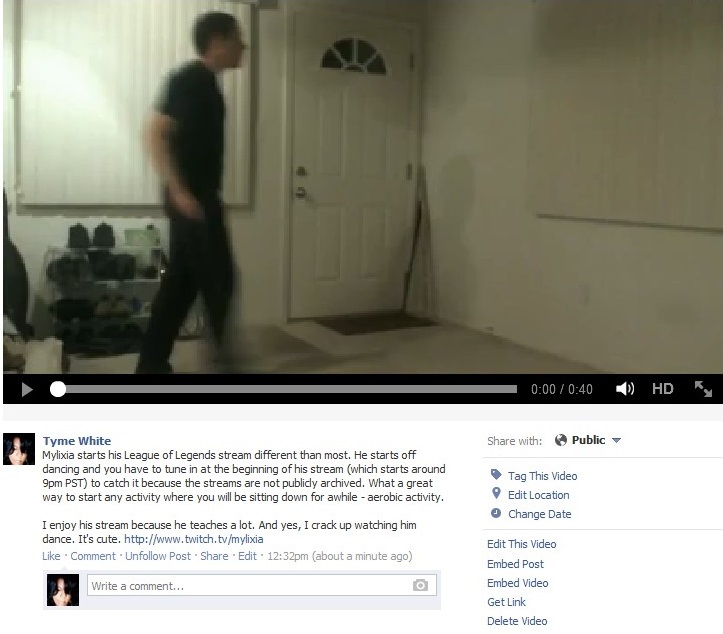 I uploaded a 40 second video of Mylixia dancing to Michael Jackson’s Bad to Facebook. It was a post to encourage people interested in League of Legends to check out his teaching stream. It was deleted – copyrighted content. I could appeal under fair use but it proves my point perfectly. His stream does not have the archives publicly available, his site is kind of bare, and his social media points back to either Twitch (stream) or the site. His YouTube has no content. In other words, if you don’t see the stream live, you miss out and if you want to share it with others, it’s hard. His community would be larger if his content wasn’t more closed down than a private profile on Facebook. If you are interested in building a community, giving subscribers (people paying to see your content) benefits is great but in every community there will almost ALWAYS be more non-paying people than paying…and those people will draw paying people to the community by spreading the word. Their voice in spreading the word can be more valuable than the money coming from the subscribers. EDIT April 2014: He has his archives open! Go. Check. Them. Out! He dances at the beginning of the show!